The beaches of Andros are an essential reason for visiting the island. There is simply one for everybody cause of its diverse and vast coastline. Each one of the attractions has its own story to tell. Small stories and legends that are lost back in time. 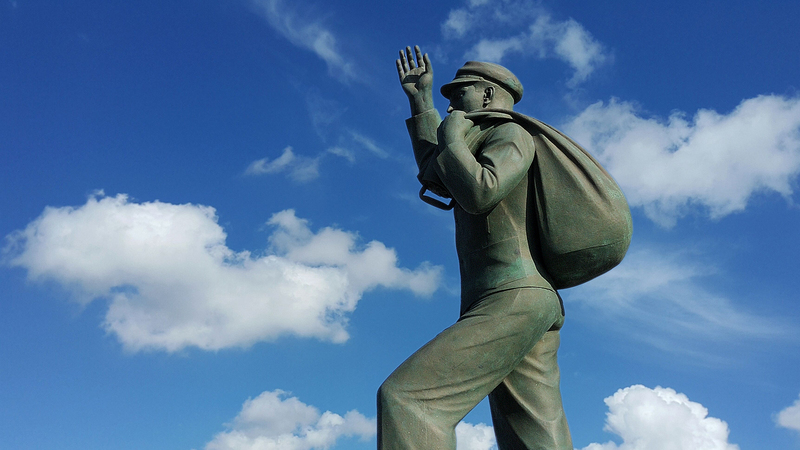 Stories worth listening to when you visit them. Meet the beautiful central locations of the island, Chora, Batsi, Gavrio, Korthi and the surrounding villages. 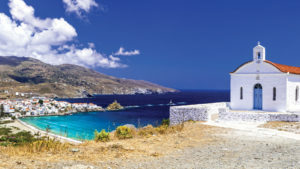 The respectable Monasteries of Andros make it one of the most important pilgrimage destinations in Greece with significant religious history and tradition. Andros Island received the European certification of the Leading Quality Trails - Best of Europe in 2015, making it a top hiking destination. In the Cyclades, there is a Greek island that certainly stands out. It stands out mainly because of nature, and the morphology which does not seems like the Cyclades. Above all, you not often you see an island that combines dry Cycladic landscape and abundant water. Lush vegetation and rare wildlife. Museums, events, and neoclassical architecture. Countless beaches and imposing mountains. As a result, these geographical and morphological contrasts make it unique. This island is Andros. Andros connects to the port of Rafina, 36 nautical miles and just 2 hours by a conventional ship. It is one of the largest Greek islands. An area of 380 square kilometres and a coastline of 176 km. The northernmost island of the Cyclades is, therefore, the second largest island of Cyclades. 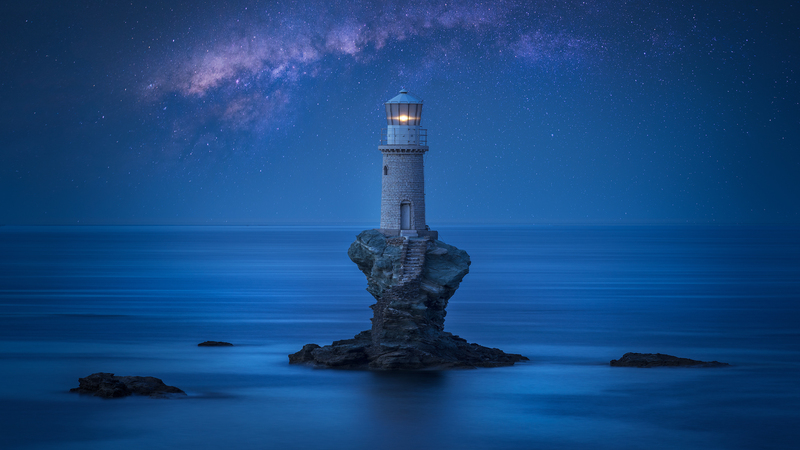 The nature of Andros will amaze you. It is the Greek island of the Cyclades that is famous for its waters. In the winter months, it floods by a large number of rivers and streams. The waters end up in numerous waterfalls and springs. Consequently, that preserves the rich vegetation with abundant trees, so many species of birds and small animals can find shelter and food. What you experience exudes a distinct aura that does not refer you to a classic Greek island in the Cyclades. The Achla River flows from Petalo, one of the highest peaks in the Cyclades. It expands to the homonym beach and has water even in the summer. Arnipotamos expands to the bay of Lefka and the Great River from Stavropeda expands to Paraporti beach. In Andros, you will see several waterfalls. The waterfall in Pithara accessed by hiking, and in Paleopoli the waters are falling from above. The most significant spring is Zenio. The most extensive volume of Zenio waters flows to all sides of the island. Krya Vrissi on the northern side of Petalo, the fountain of Koumoulou in Menites village, are some of the scattered throughout the island. 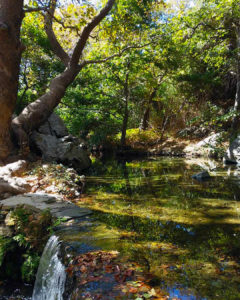 The source of Sariza in Apoikia, with the homonymous table water, is considered curative. 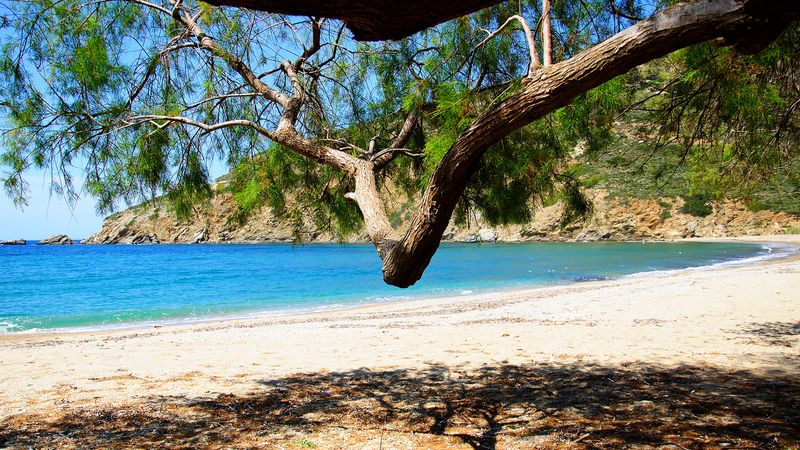 In Andros, there are trees such as plane trees, willows, poplars, oaks, pine trees, maples. Among them emerge lentisk, oleander, fig, mulberry, olive trees, reeds, merolies, laurels, brushwood. Spring wildflowers make up an incredible carpet of anemones, orchids, and bells. The perfumes of the gardens and orchards confused with thyme, oregano and create a unique atmosphere. In Andros, many bird species find shelter and food. Owls, nightingales, partridges, woodcocks, tortoises, carders. Rare predators such as Mavropetritis, a dark hawk that is one of the most endangered species in Europe. Mavropetritis reproduces in the Cyclades in Andros and Skyros. He is fleeing to winter in Madagascar. Vegetation shelter many small animals, badgers, rabbits, hedgehogs, and hares. Also many turtles and frogs. The island is suitable for many activities during the more significant part of the year. It is the only Greek island, but also the single island in Europe with a certified network of hiking trails (100 kilometres). The long association with the sea makes it one of the islands in the Cyclades you can enjoy water activities such as Wind Surf, SUP, and scuba diving from experienced people and famous athletes. Andros has an extensive network of hiking trails. This tracks connected the settlements, places of worship and the ports of the island. Andros still has a pervasive system of hiking trails, which is estimated to exceed 300 kilometres. The accessible hiking trail network today is about 150 km. The paths are maintained with the concern of a significant collective effort of people, with a particular love for nature and sometimes with the help of volunteers from all over the world. In the sea around the island, there are reefs, caves, and rocky islets. As also as many of the most significant shipwrecks in the Cyclades. The reason is probably that the island was a commercial hub and that the currents lead to the beaches. Some of the best recognised are the “Anita” cargo ship and the “Elli” steamer. Moreover, at Vori beach you will find Semiramis and two more sunken ships. Noteworthy also is the “Mastropetros” near the reef of Vouvi. Therefore in Kypri beach, you can discover the magical paradise of the seabed. 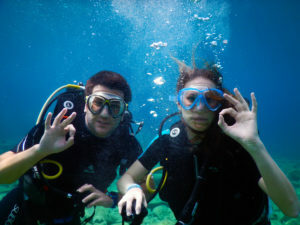 The help of experienced divers will take you on an unforgettable adventure. Windsurfing is one of the most exciting sports in the sea. Amateur and skilled surfers are playing with wind and waves every summer to some Greek island in the Cyclades. Andros has history and distinction in the sport and many locations that offer for it. The equipment? A board. But to stand still and then start dancing with the waves requires practice and wind. Of course, if you are doing the tricks of Kaklamanakis, the wind, the sea, and the sky are yours. If you are a fan of SUP, you can stand and balance in the endless blue. 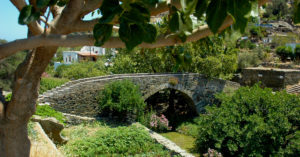 The Greek island in the Cyclades that carries a long history and travels to art and culture, it is Andros. Museums housing with world-class exhibitions, finds and collections of immense value, naval tradition and the imprint of the life of the island in every corner. Archaeological sites of particular importance such as Stropilas, the “Most Ancient City of Europe” dating back to 4,500-3,300 BC. The Museum of Modern Art houses a collection of works by Greek and foreign artists. Similarly, plastic arts at the Kydonieos Foundation meet music, theatre, and literature. The Archaeological Museum, with essential findings from excavations in Andros and the Naval Museum, reveals the history of Andros shipping. The Museum of Folklore and Christian Art depicts the life of Andros and Christian art. The Kairios Library with nearly 3,000 volumes of the Theophilos Kairis collection. Furthermore the Archaeological Museum of Palaeopolis with the unique hymn in Greece honouring the goddess Isis. The small animal-powered olive extraction module sample in Cyclades Olive Museum. Also, International Festival of Andros gives this high-level cultural event in the Cyclades. The Gavreiotika with various cultural events. Concerts performed by the Philharmonic and Choir of the Musical Association. 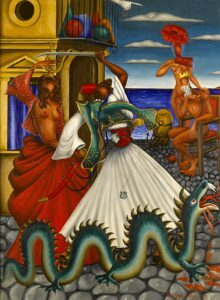 As a result of an art-loving Greek island in the Cyclades. Neoclassical buildings, Venetian tower-houses, stone-built houses coexist with the Aegean Sea on a unique Greek island in the Cyclades. Farmhouses, towers, and captains mansions. Structures as the huts, the fountains, the mills and pigeon decorated with triangular shapes. One stone upon another with the craftsmanship of the local craftsmen. Stone walls are separating the fields on the slopes of the mountains and at the same time retain the soil. 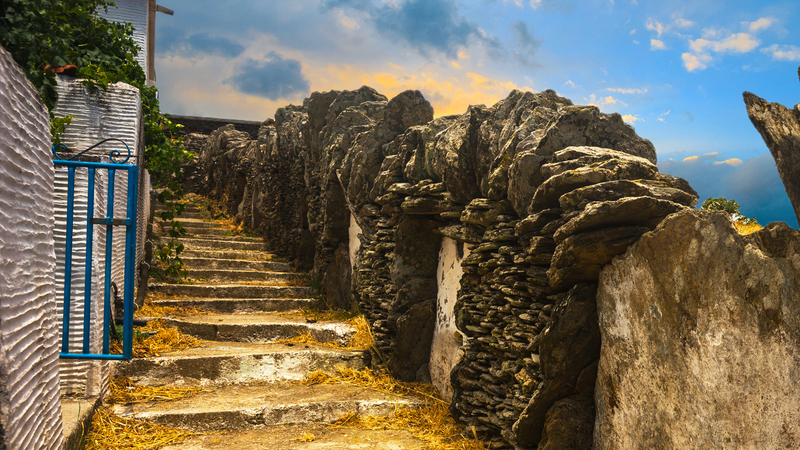 On the island there are several stone bridges, built with slate, forming part of the old transport network. 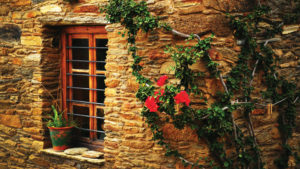 Andros produces good olive oil, wine, raki and pretty tasty cheeses by local Cheese factories. Regional dishes are Fourtalia, omelette with potatoes, mint, sausages of Andros and glyna. Furthermore, Labriatis. One of the richest and fragrant Easter dishes in the Cyclades, with the goat stuffed with cheeses, eggs, rice, mint. Citrus fruits are converted to spoon sweets, as also as almonds in Amygdalota with flower-water, sprinkled with powdered sugar. Finally, the desserts of Andros are famous all over the Cyclades. 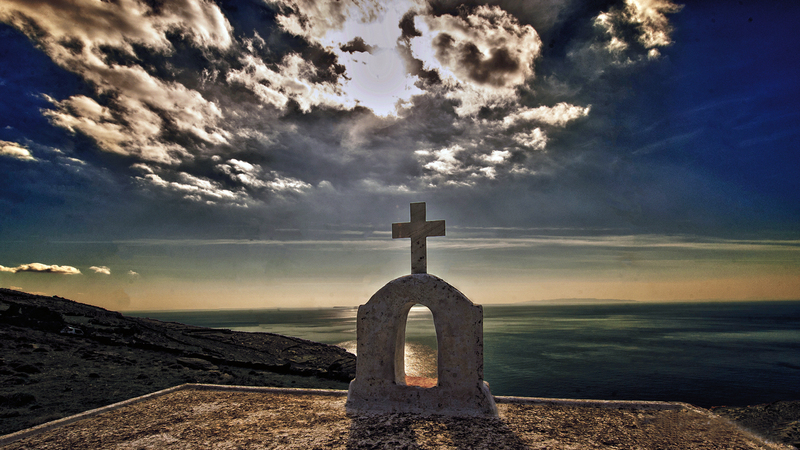 Finally, we are waiting for you on a Greek island that adorns the Cyclades!